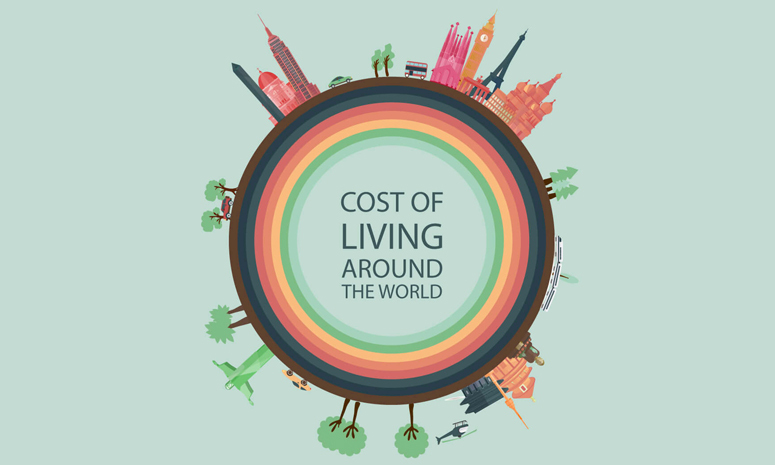 This international cost of living infographic is a valuable tool for gauging disposable income and business prospects overseas. Using figures from Numbeo, the world’s largest database of user-contributed data, Movehub created this infographic comparing the cost of living in major cities worldwide. The infographic compares costs of living in different countries versus the Consumer Price Index in New York. Example: If a country is indicated to have a CPI of 90, it has a median living cost 10% cheaper than NYC. What is included in the Consumer Price Index? These groups and categories can change from time to time and don’t include such expenses as income and Social Security taxes and expenses related to savings and investment items such as stocks, bonds, real estate, and life insurance, as these do not tend to represent day-to-day expenses. The cost of living can vary dramatically within countries, or even specific neighborhoods. For example, $6,529.96 in San Francisco, CA is roughly the same as $3,300.00 in Wichita Kansas. Rural China might as well be in a totally different country from Shanghai, and so on. In developing countries, the divide might be even far more dramatic, with metropolitan areas being several orders of magnitude more different than small urban centers and rural areas, to an extent that First Worlders might not realize. Other important lifestyle factors such as crime rates, the reliability of public infrastructure, corruption, and many others are not accurately reflected. The American Consumer Price Index may not be the best standard to judge living costs in other countries. Ready to take your small business global? Comment below!